A few months ago a client contacted me about making her a shower curtain. 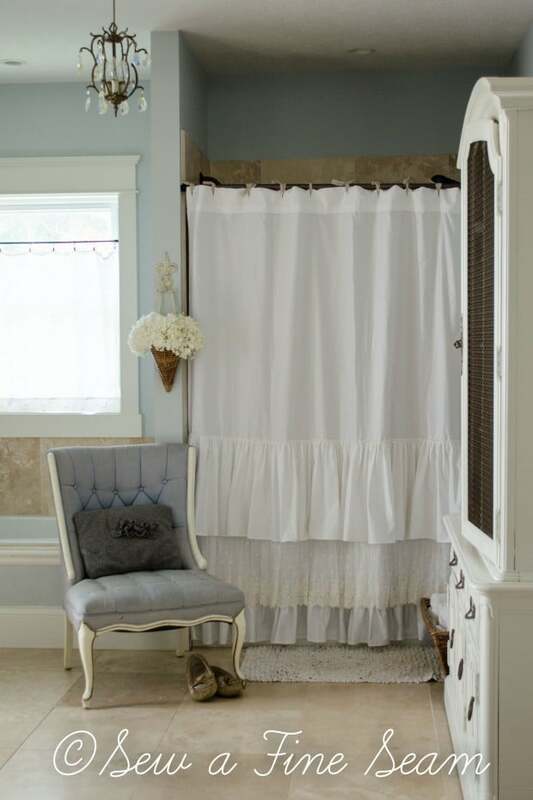 She had seen the ruffled shower curtain I made for another client and wondered if I was interested in making another. 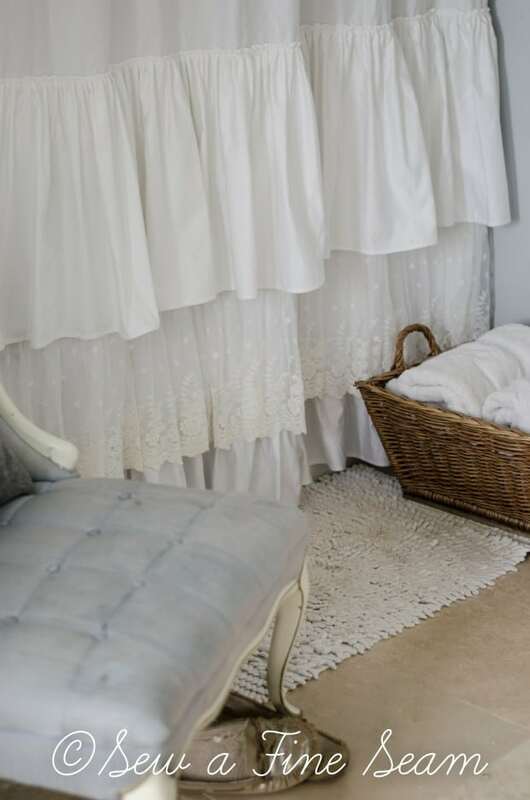 And she wondered if we could use a fabric a bit finer than the humble drop cloth and if we could incorporate a bit of lace. She sent me a photo of the shower curtain of her dreams and I set about to do my best to create one as much like it as possible. The main fabric is so beautiful and so very very simple to use because it began its life as a bedsheet! The top was already finished beautifully with a large header and some pretty tucks. It was already hemmed on the edges which cut down on the sewing time. My client mailed the sheets to me – 2 to use for the main curtains (she wanted two curtains to make them extra full) and an extra sheet to use for the ruffles. 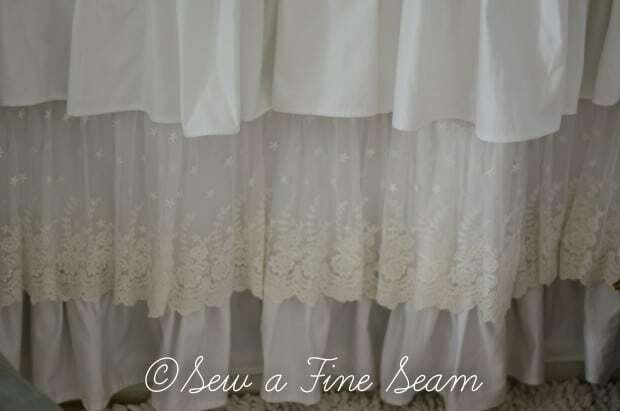 The beautiful wide lace I found on etsy – you can find lots of reasonably priced, wide lace in this shop. After creating these lovely shower curtains I begged a friend to let me use her lovely bathroom to photograph them. 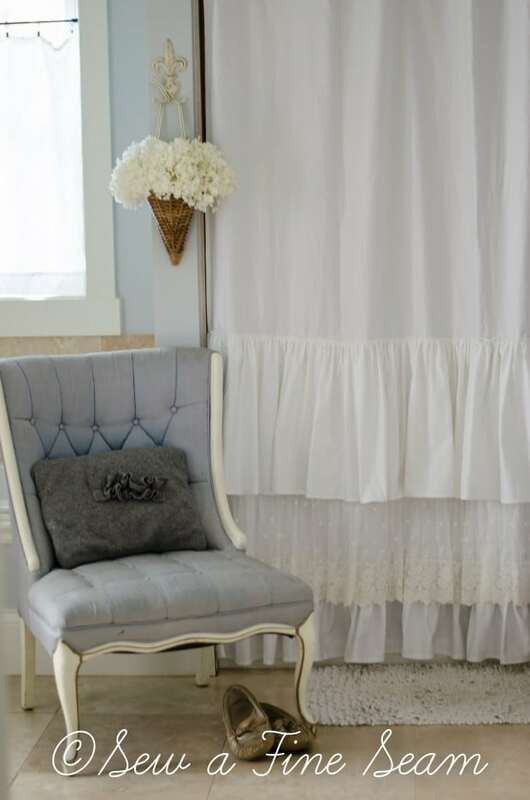 I’m thinking I need to create a curtain like this for my bathroom. So pretty and fun. I did snap some pics of a few tips to help you make one of these yourself – I’ll share the tutorial tomorrow! Elegantly made and photographed with LOVE! That’s beautiful! I love the ruffles. The whole bathroom is pretty! 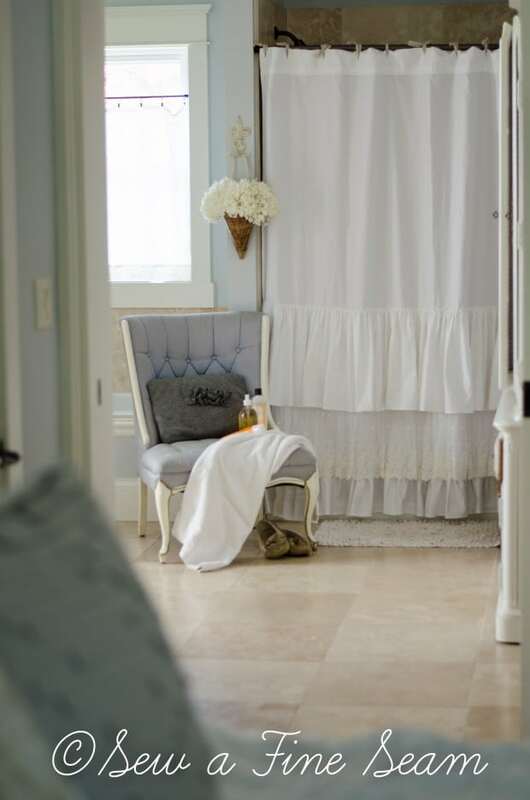 Thanks Kelly – I love this bathroom so much! There is a huge walk-in closet off to the left too. It looks beautiful!!! You bathroom is gorgeous! Thanks Angela – isn’t that bathroom great?! It’s my friends and I admit I am a bit envious! Love this! 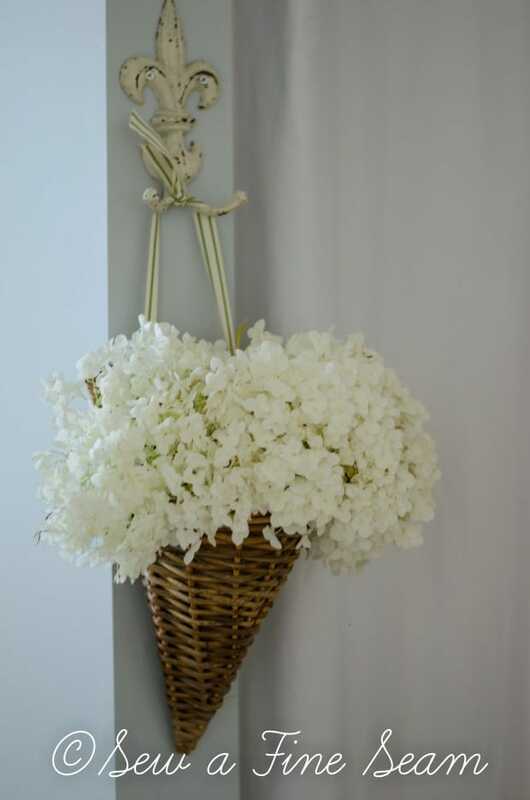 I hope to create something similar in the Fashionista’s new bathroom. Thanks laura! I’m sure you will create a beautiful one too! Wooooow, what a beautiful shower curtain and what an amazing bathroom!! Thanks Lisa – and my friends whole house is amazing! Can you imagine having a bathroom big enuf to have a buffet/hutch in? Very nice photography Jill. Your friend will be wanting a shower curtain like that also. 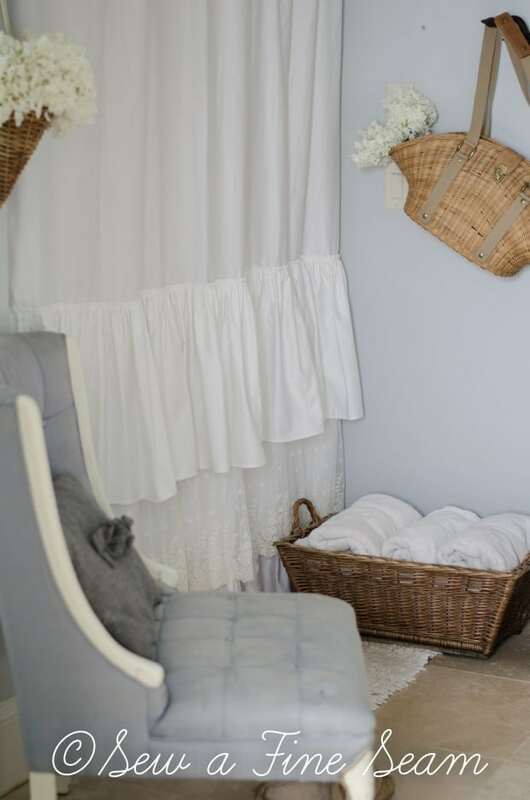 The curtain is very pretty, I’m not one usually for ruffles but have to say love how that curtain looks. Not overdone with ruffles. Her little chandelier fits right into the idea of the room. That’s another thing I’m starting to yearn for – a chandelier. NO place to hang one but would like one anyway. In our bathroom would be pretty, with candles instead of electric lights. No outlet to plug one in. 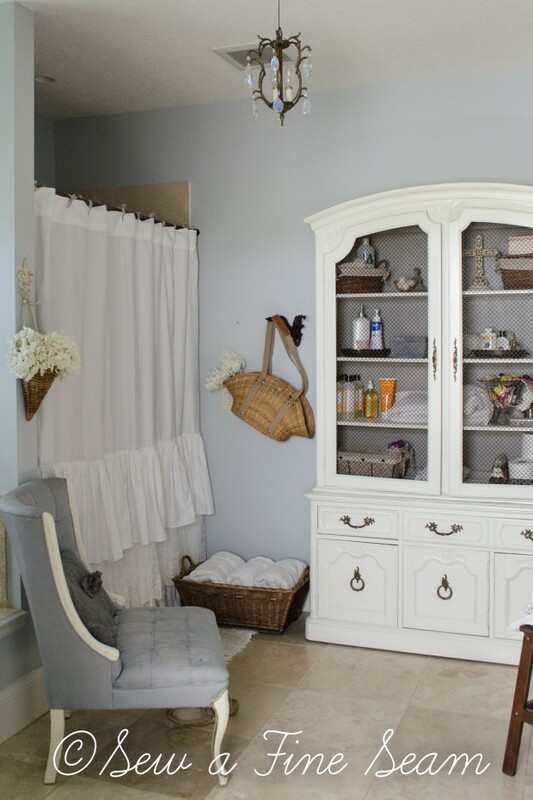 I know JaneEllen, I love her bathroom – her whole house is gorgeous! I have a hard time not envying her just a bit! Such a pretty shower curtain. 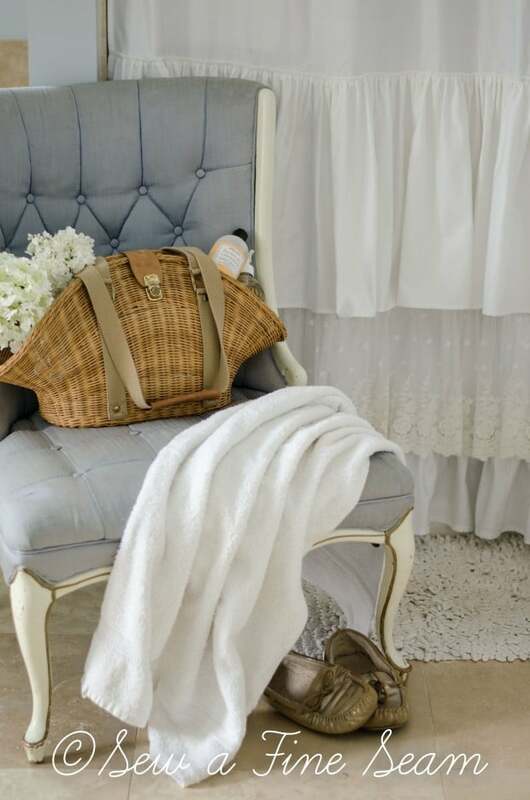 Love the lace you chose and the ruffles – just lovely. Thanks Suzanne – I love how this turned out and my client was very happy!